The tufted back cushion of the Cara inspires a timeless sense of elegance. The tailored, vintage look completes any room whether you are mixing modern and traditional elements or just want a classic, welcoming look for your newly styled living room. Quality is not sacrificed by style. This Best Home Furnishings power lift recliner is made of dry-kilned, solid hardwood frame parts, reinforced joints and a heavy-duty steel mechanism. 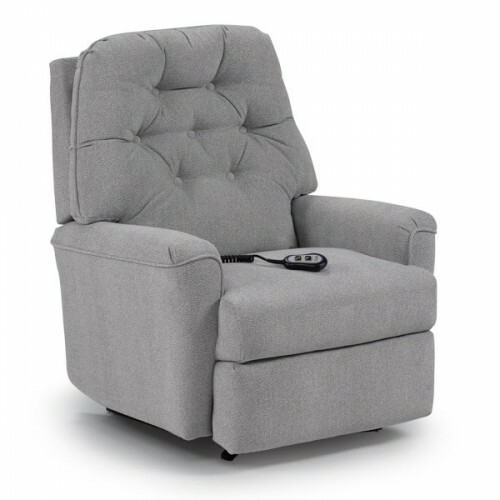 Customize this recliner with one of 700 cover options to reflect your taste and choose your base from either a Space Saver, Rocker, Swivel Rocker, Swivel Glider, Power Lift, Power Rocker or Power Space Saver.